As I mentioned monday, I would look into the final two areas I would like to analyze around BTLs. First off, a simple compare of 2 x Supernova vs. Twin Supernova. 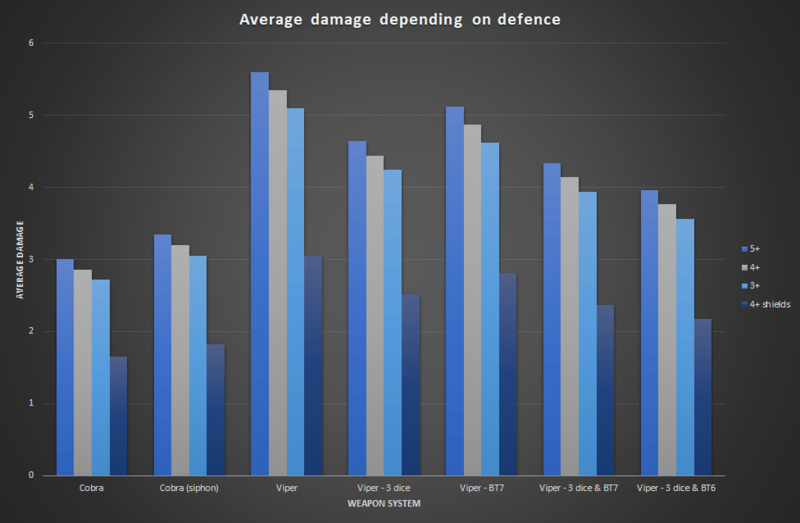 Looking at average damage with any other weapon system, it should be the same. But due to the dependencies of consecutive rolls for BTLs, this is not the case. Unsurprisingly, damage is better from the Twin Supernova than from 2 Supernovas. But another interesting fact appears – chances are considerably better to create major spikes using the 2 Supernovas. When thinking it over it makes sense – it stems from the fact that a minor spike is added just by causing at least one hit and here we have two weapons with that special rule rather than just one. All in all – the only advantage you get from two supernovas over a twin supernova is the increased chance of a major spike. 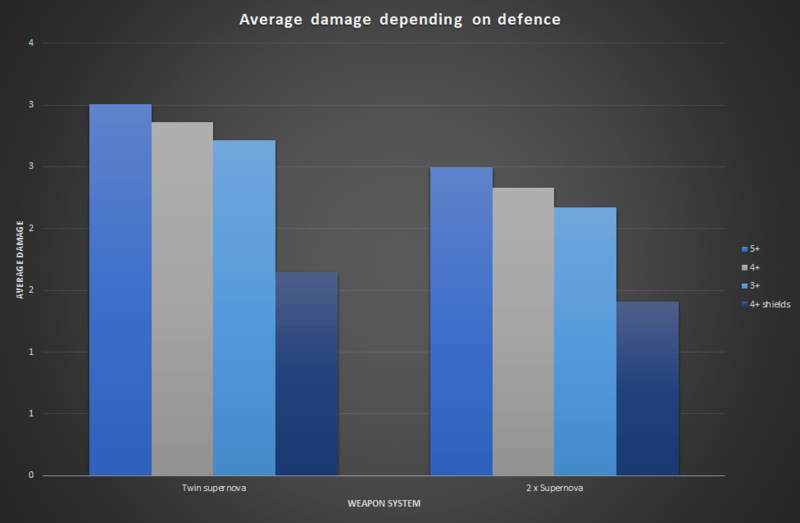 When looking at the different BTLs, the Viper stood out as being way to good – it was simply in a league of its own being around 86 % better across armour saves than the Cobra. While it does have the disadvantage of Bloom, that still seems a bit too good. Reduce BT from 8 to 7. Reduce attack dice from 4 to 3. Reduce BT to 7 and attack dice to 3. Reduce BT to 6 and attack dice to 3. Below is shown the different average damages from compared to the three alternative BTLs in UCM. Notice that all of them are still considerably better than the Cobra. To make matters simpler, we can also do a tabular and percentile comparison. I am here comparing them against the Cobra which I believe they should be better than. 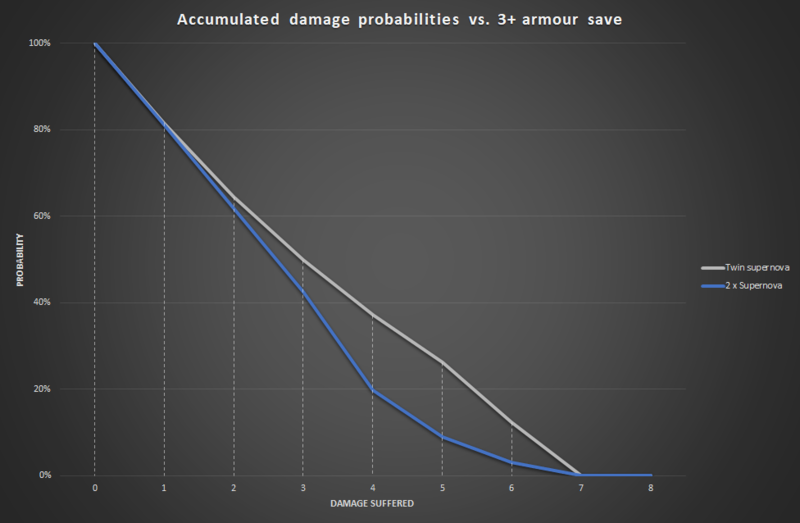 Since the percentile difference is more-or-less the same irrespective of defence typer and size, I will only look at 3+ armour save. So, what is the better balanced option? There is no easy answer to this. Personally I think that 4 dice is too good, and 3 dice would have been a better choice. Whether the BT is then 6, 7 or 8 is a matter of preference. Arguing for BT 8 or 7 is the fact that the Perth is 86 % more expensive than the Berlin, and while it does have Bloom, it also have 4 extra Hull to compensate for that so to some extent, you might argue that the price and damage increase follow along nicely (I here regard the UF-4200 mass drivers as irrelevant in this, as the Weapons Free is not a common order for a BTL ship). So in the end, I guess I my preference would be a reduction to 3 attack, 3+ lock and Burnthrough(8) – not that great a change, in fact.